Bookseller and MP WH Smith lived here. Description: Every high street and station or terminal has one, a WH Smith, the retail king of stationery and newspapers. William Henry Smith was not just a retail pioneer, but also a very high profile MP and twice was the Secretary of State for War. 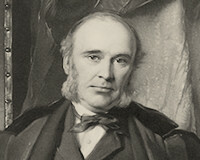 He later became the Leader of the House of Commons. Smith (1825-1891) lived here in this unusual and grand white facade mansion.